This initial series of eight models were issued to launch the new, and re-tooled Routemaster castings introduced during the Autumn of 2006. The original RM, RML, RCL and prototype RM's were all re-tooled and gained improvements including new flush glazing, driving mirrors, and a rear platform bulkhead window. New castings of the BEA Airport RMA, short Green Line RMC coach, and the front entrance Routemaster (RMF1254/ Northern General) were also added to the EFE range to complete the Routemaster family of models. 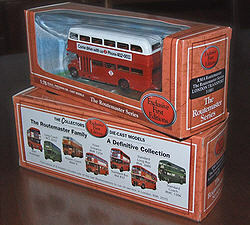 The first releases of all the new and improved castings were issued in special themed boxes and consisted of seven different types of London Transport Routemaster. The final model depicted an Arriva South London RML as it appeared on the final day of normal London Routemaster operation in December 2006. This series wasn't allocated its own numbering scheme like the earlier World War II models, each model instead being issued in its own new series (315-321). The initial batch of eight models were released between October & December 2006. A reworked version of the RMF model was produced for EFE Subscribers in May 2011 and this was followed by a couple of reworked models which have all been issued in the original packaging. 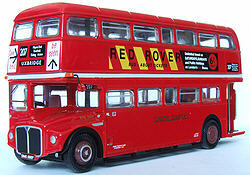 Since 2011 a number of models, including a single deck RM bus and a standard double deck version, have been issued in special "The Routemaster" boxes. The packaging has the same vehicle photographs on the rear as the earlier 2006 models, but the base colour of the boxes is fawn rather than orange. 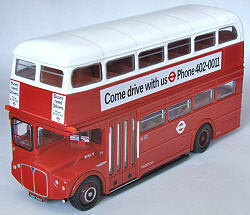 For full details of all the other EFE Routemaster models see the Short Routemaster and Long Routemaster sections.